This one is going to keep you up all night, so get ready. Vanishing Girls by Lauren Oliver. GOODNESS. It starts with two sister, Nick and Dara who have been inseparable for all their lives. But then boys and drama and drinking get in the way. Nick, who is a year older, has always been her sister’s keeper–shielding her when she comes home wasted or covering for her when she doesn’t come home. But after a car accident, they’re not talking or acknowledging each other’s existence. It took me about 100 pages to really feel invested in the book, but once I was in, I could NOT stop reading. You get the sense about half way through that something is wrong, you’re being lied to or kept from something–and so I stayed up until 2 AM on a school night (GASP!) to find out what I was missing. OH MY GOSH. I was so caught off guard and shocked. Then I stayed up even later going back to re-read sections. 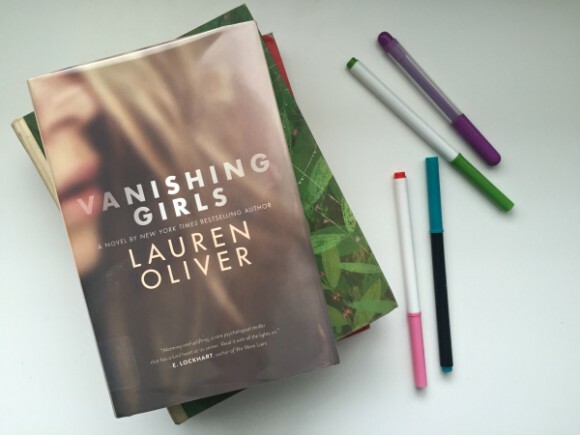 Vanishing Girls by Lauren Oliver is addicting and so twisty! I loved it. She’s written lots of other books; I used to have a couple on my classroom shelves but had never been drawn to them before. I think that has changed. Read this and let’s talk about it! GAH.